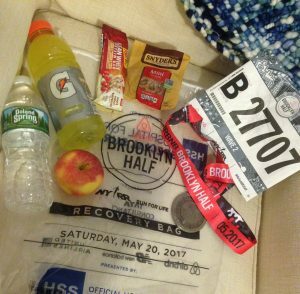 My virgin overseas race: Airbnb Brooklyn Half 2017 | JustRunLah! 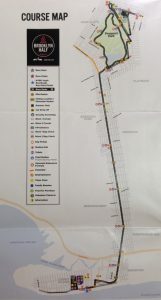 Expecting the unexpected, I only finalised my itinerary – flights and accommodation – about 2 months ahead of the race. But life, as it is, decided to fuel my race anxiety when my initial Airbnb host had to cancel her offer only a few days before my flight to New York City! A blessing in disguise as it turned out – I managed to find a wonderful Airbnb host and an accessible location that was just a stone’s throw away from Brooklyn Half’s start point that was near Brooklyn Museum. I landed in NYC on 18 May late night, settled down in my new ‘home’, and headed off to collect my race kit the following day at the race pre-party. Airbnb Brooklyn Half Pre-Party took place over 3 days (17-19 May) at Pier 2 in Brooklyn Bridge Park. 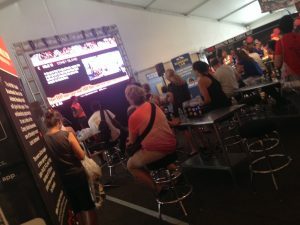 It reminded me of something similar put up by Sundown Marathon organizer this year, though the Brooklyn Half pre-party seemed more organized and neat with race kit collection, sponsors’ booths, merchandise sale, and running clinic talks all housed in a single big well-ventilated marquee. 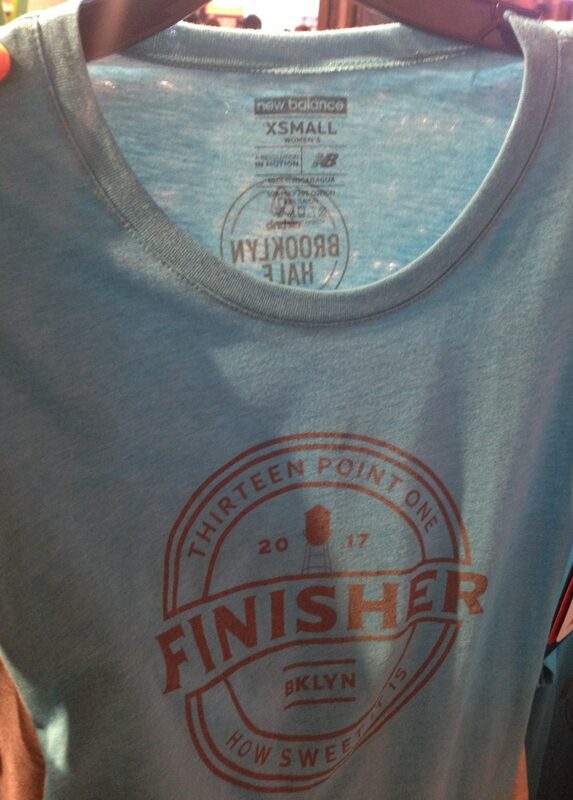 An interesting note – anyone could buy the finisher tee even before the race took place! My race anxiety (and probably jet lag too) allowed me no more than 3 hours of sleep before the big day. After a quick breakfast of rice cakes and rice milk, I walked to the start point, about 2 hours ahead of my designated wave-off time at 0745. Runners were put in 2 major waves and many corrals (sub-waves) with an interval of 2-5 minutes per wave/corral. Before we could drop off our belongings and enter our corrals, we had to go through strict bag/security check (much like the ones in airports). After much deliberation, I surrendered to the ever biting wind and kept my jacket with me for the race. The weather was most unpredictable with my first day in NYC being unbearably warm and the next day, i.e. race day, being unbelievably chilly. Before the first wave was flagged off, the national anthem was sung, something new to me. Then, in an orderly yet swift manner, each corral was waved off as designated. 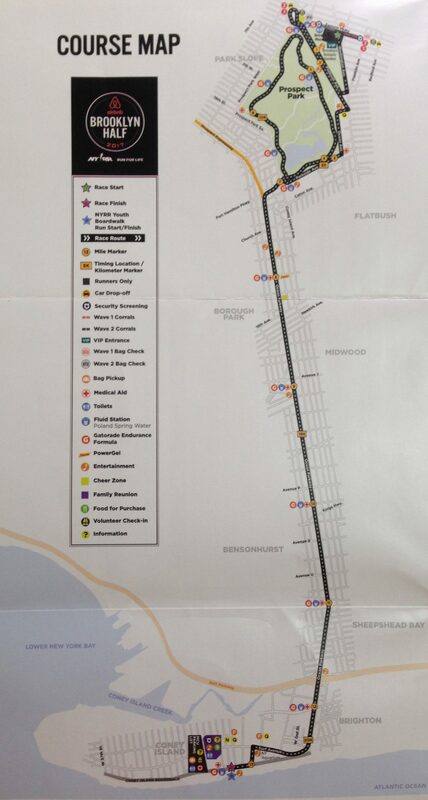 The half-marathon route began in Brooklyn Museum and looped briefly around Prospect Park before stretching endlessly on the straight long road, Ocean Parkway, to Coney Island. 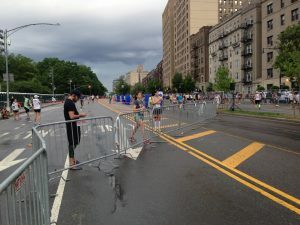 The route was basically flat with occasions of slight elevation in the Prospect Park loop. Hydration stations were aplenty, with one every 2-3 kilometres there were lined with abundant water and electrolyte drinks (which provided me with plenty chances to take much needed hydration breaks in seconds). 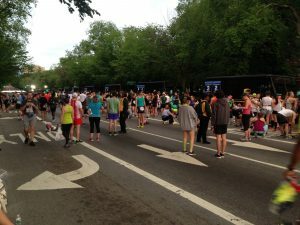 What motivated me most were both the fearless fellow runners who would just pound on the roads relentlessly and the crowds (be they family members, friends or just strangers) lining the streets ready to cheer us on with placards, pom-poms, a song or a dance. Racing in the US is more than a personal affair – it is a family-bonding event, an atmosphere so lacking in Singapore. I started out strong and fast (maybe a tad too fast) and struggled near the end, with a cramp and loose jacket about 200 metres away from the finishing point! By the time I managed to regain my composure to finish it all, I missed my goal of sub-2. The consolation was – it turned out to be my PB. Much like the races in Singapore, upon reaching the finishing line at Coney Island, runners were handed their medals. The main difference is the Brooklyn Half finishers got to collect a bag of recovery goodies – water, food, etc. There was a lot going on at the MCU Park in Coney Island – more food, beer, entertainment, but being exhausted, hungry and sweaty, I decided to join the others who were making their way to the subway. My recovery bag and medal! 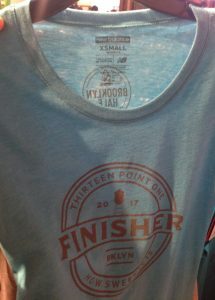 The trend in US is not for a runner to parade around in a finisher tee, but to don one’s hard-earned medal right after the race. No wonder the medal is much bigger and more intricately designed! Updated results – both unofficial and official detailed results (including ranking by gender, age, and overall) were readily available online. Unpredictable weather – okay, this is hard to get anyone to get prepared, but maybe reminders/tips could be given ahead (I wasn’t the only one almost frozen by the biting wind; only hot-weather tips were given in print). Limited photos – only limited event photos were available. No photos of individual runners were taken or provided. Pricey entry – at US$100, participant received a nice technical/race tee, a large beautifully designed medal (for finisher), a recovery goodie bag, and wonderful logistics/ support. BIO: Having finished numerous local races for about 5 years, it's time for me to run the world! 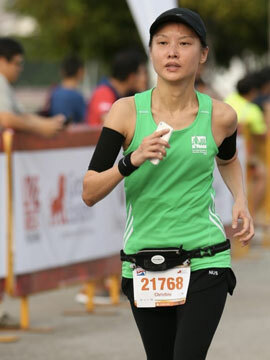 This blog shares my thoughts and views on the half-marathons I've run abroad. Click here for more post from HMRunner.